Each week, Brian Bayless and Jennifer Smith will recap the week that was in WWE TV. Share your thoughts with us via social media! Matt: Match of the Week was easily the WWE Title match from SmackDown between AJ Styles and Daniel Bryan. This match was fantastic. I loved all the limb work during the match and I especially loved how AJ working over Bryan’s leg throughout the match lead to AJ scoring the submission victory. Great, great match. One of my favorite matches of the year. Highly recommended. Brian: The #1 contender’s match on 205 Live between Mustafa Ali and Tony Nese was a very good match despite the anticlimactic finish. Both guys have really stepped up their game this year and involving Cedric Alexander and Buddy Murphy at the end seemed like a given but could lead to a great tag team match down the road. Matt: The Segment of the Week this week comes from NXT and it was the show closing brawl between Undisputed Era and War Raiders & Company setting up the War Games match at TakeOver. This was an excellent brawl and I thought it was a great way to officially announce the War Games match. I really enjoyed this. The War Games match should be absolutely incredible. Brian: Seth Rollins calling out Dean Ambrose and demanding he explain his actions from last week was the most effective segment of the night on RAW. He showed a lot of fire and has really come a long way as a babyface. 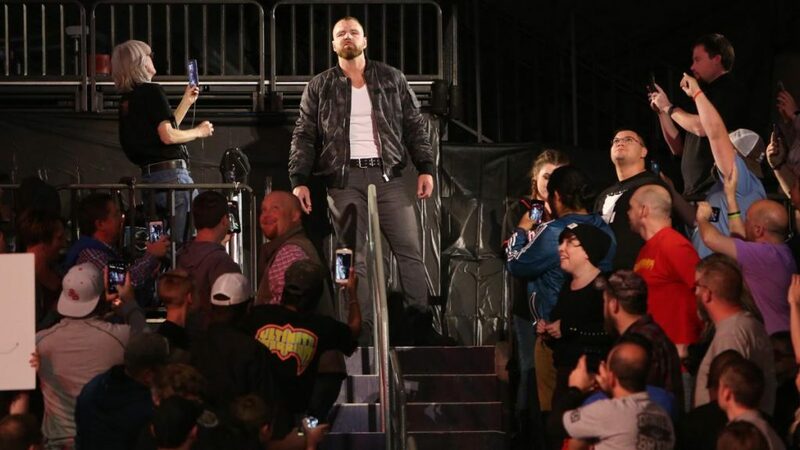 Having Ambrose hang out in the bleachers and refusing to speak before leaving was a nice touch as they will let this play out for a bit before Ambrose reveals his motives. “For you… no” Elias to Dana Brooke after she asked him to play a song for her. Matt: Samoa Joe’s post match beating of both AJ Styles and Daniel Bryan was a solid enough way to reintroduce Joe back into the WWE Title picture. Never. Split. New. Day. Up. They came out for the Trick or Street Fight dressed as The Brood (or The Brood Day as I’ve coined them) complete with the entrance music, costumes, and people holding fake fire surrounding them. It was arguably the best thing on the show! They are so damn entertaining. They find something new and unique to do every week. EVERY WEEK! The tag match between Rey Mysterio and Jeff Hardy against The Miz and Randy Orton was a fine way to continue the build to the World Cup tournament taking place at Crown Jewel. On a normal week, the Nikki Cross vs. Mercedes Martinez match from NXT would have been my pick for Match of the Week. Really good match. The post-match with Candace LaRae and Aleister Black was interesting as well. I am really loving this Aleister Black/Johnny Gargano feud. They made the best of a bad situation (Black’s injury) and turned it into a compelling storyline. Well done. The King of Bros Matt Riddle is here!!! What a great debut for him as he looked fantastic in his victory over Luke Menzies. I hope they have big things in the pipeline for Riddle. He could be and should be a future star for WWE. Brian: The 10-woman tag match was fun and easily the best match on RAW. It was nice to see Trish Stratus & Lita wrestling on TV. I also thought it was great to show kids with cancer and other illnesses sending messages to Roman Reigns about beating cancer. Letting them get the chance to make someone they admire and can relate with feel better is a wonderful thing to see. And Elias’s act hasn’t missed a beat as a babyface. He was entertaining in clowning on Baron Corbin. For 205 Live they set up for a lot of tag matches with Kendrick & Tozawa vs. Gulak & Gallagher and they even teased an alliance between TJP and Mike Kanellis against the Lucha House Party as 205 Live continues to deliver good to great in ring action with storylines that make sense. Matt: I am convinced that WWE has zero idea of what to do with Shinsuke Nakamura. Sure he’s the US Champ but he has done nothing since winning it. That being said, I also feel like Nakamura is not without blame. It seems like just been going through the motions as of late. He had a middling match with R-Truth this week and I feel like it’s been months since he’s done anything of substance. Brian: All of the hype for the Crown Jewel PPV fell flat. Besides the fact fans are turned off by the show the build has been poor. The main problem with RAW is that there are a lot of acts that are either not over or just plain bad. Finn Balor vs. Bobby Lashley was a dull match and the Lashley act is still ice cold but regardless he was hyped up as a favorite to win the Crown Jewel World Cup Tournament. Also, Ember Moon had a great showing in the Evolution Battle Royal yet they reduced her to a pawn for a potential Nia Jax vs. Tamina feud. Why not feature the person with potential instead of someone who has shown little progress in almost a decade on the main roster? And the opening segment with Braun Strowman and Brock Lesnar & Paul Heyman was really uninspired.